There are 24 names in this directory beginning with the letter F.
Termination of one's bloodline. The words are most often used in a will or deed to refer to a condition that operates in the event either no children be born or no children survive the descendant. These words, or the phrase "die without issue" may fix a condition whereby a estate will, in the event of failure of issue, pass automatically to an alternative person or in an alternative manner designated in the will itself. A Federal law that is designed to prevent inaccurate or obsolete information from entering or remaining in a credit report. The law requires credit bureaus to adopt reasonable procedures for gathering, maintaining, and disseminating information and bars credit bureaus from reporting negative information that is older than seven years, except a bankruptcy, which may be reported for ten. If you notify a credit bureau of an error in your credit report, the FCRA requires the bureau to investigate your allegations within 30 days, review all information you provide, remove inaccurate and unverified information and adopt procedures to keep the information from reappearing. In addition, the law requires that Creditors refrain from reporting incorrect information to credit bureaus. State statutes that permit a manufacturer to establish minimum resale prices that may not be varied by wholesaler or distributor. Such agreements do not violate the antitrust laws when they are entered into under the provisions of the state fair trade laws. In federal copyright law, an insubstantial permitted use by another of material protected by copyright. 1. A requirement that broadcasting stations present contrasting viewpoints on controversial issues of public importance. This doctrine imposes two affirmative responsibilities on the broadcaster: a. To present adequate coverage for controversial public issues and b. To ensure that this programming presents differing viewpoints so that the public are fully and fairly informed. Unlawful arrest, unlawful restraint of another's personal liberty or freedom of locomotion. It may be a criminal offense or basis of a civil action damages. As a tort, the intentional, unjustified detention or confinement of a person. 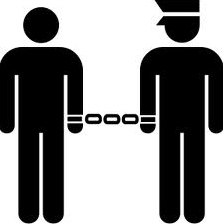 Where the restraint is imposed by virtue of one claiming legal authority to do so and an arrest occurs, it will be false arrest as well as false imprisonment. The statutory crime of obtaining money or property by making false representations of fact; also known as misinterpretation. An agency of the U.S. Department of Justice, charged by law with investigating violations of all laws of the U.S. government, except those expressly assigned to other agencies. The U.S. courts (distinguished from the courts of the individual states), including district courts (general courts of original jurisdiction, which are the federal trial courts), courts of appeals (formerly circuit courts of appeals, which are principally appellate review courts), and the Supreme Court (the only court created directly by the Constitution, and the court of last resort in the federal system). Other specialized courts in the federal system are court of claims (hears suits involving allowable claims against the U.S. government), court of customs and patent appeals (reviews customs court decisions), and customs court (reviews decisions of the customs collectors). 1. A serious crime (contrasted with misdemeanors and infractions, less serious crimes), usually punishable by a prison term of more than one year or, in some cases, by death. For example, murder, extortion and kidnapping are felonies; a minor fistfight is usually charged as a misdemeanor, and a speeding ticket is generally an infraction. 2. An act on the part of a Feudal Vassal involving the forfeiture of his fee. 3. a: A grave crime formerly differing from a misdemeanor under English common law by involving forfeiture in addition to any other punishment. b: A grave crime declared to be a felony by the common law or by statue regardless of the punishment actually imposed. c: A crime declared a felony by statue because of the punishment imposed. d: A crime for which the punishment in Federal law may be death or imprisonment for more than a year. A method by which employers insure themselves against the dishonesty of their employees through which the company suffers financial loss. It is a legal contract and is not something you carry around like a driver's license but something similar to an insurance policy, applying to a specific set of circumstances. A person having duty, created by his undertaking, to act primarily for the benefit of another in matters connected with his undertaking; one who holds a position of confidence, as, for example, a trustee. 1. The amendment to the U.S. Constitution, part of the Bill of Rights, that establishes certain protections for citizens from actions of the government by providing a.That the person shall not be required to answer for other infamous crime unless an indictment or presentment is first issued by a grand jury. b. That no person will be placed in double jeopardy. c. That no person may be required to testify against himself. d. That neither life, liberty nor property may be taken without due process of law. e. That private property may not be taken for public use, without payment of just compensation. The decision of a court on issues of fact. The decision's purpose is to answer raised by the pleadings or charges. It is designed to facilitate review by disclosing the grounds on which the judgment rests. Findings of fact are made by a jury in action at law, or, if there is no jury, they are made by the judge. Generally, the termination of a right to property; specifically, an equitable action to compel payment of a mortgage or other debt secured by a lien. As to real property, foreclosure is precipitated by nonpayment of the debt or other default under the loan agreement, and leads to the court's order that the property to which the mortgage or lien is attached be sold to satisfy the debt. Belonging to the courts of justice; indicates the application of a particular subject to the law. For example, example, forensic medicine employs medical technology to assist in solving legal problems. One of the so-called "Civil War Amendments" to the Constitution in that it was ratified after the Civil War; protects all persons from state laws that attempt to deprive them of "life, liberty or property, without due process of law," or that attempt to deny them equal protection of the laws. The amendment has been used to extend the protection of almost all of the provisions of the Bill of Rights to citizens of every state. 1. A special privilege that is conferred by the government upon individuals and that does not of common right belong to the citizens of the country. For example, a municipality may grant to a local bus company a franchise that will give it sole authority to operate buses in the municipality for a certain number of years. 2. The right given to a private person or corporation to market anothers product within a certain area. 3. Elective franchise (sometimes called simply "the franchise") refers to the right of citizen in public elections. Intentional deception resulting in injury to another. Fraud usually consists of a misrepresentation, concealment or nondisclosure of a material fact, or at least misleading conduct, devices or contrivance. A federal law requiring that, with specified exceptions, documents and materials generated or held by federal agencies be made available to the public and establishing guidelines for their disclosure. The federal constitutional requirement that the public acts, records and judicial proceedings of one state be respected by each of the other states. Thus, if a judgment is conclusive in the state where it was pronounced, it is equally beyond dispute everywhere in the courts of the United States. The judgment is entitled to full faith and credit when the second courts inquiry discloses that the same questions were properly before the first court and were fully and fairly litigated and finally decided there.